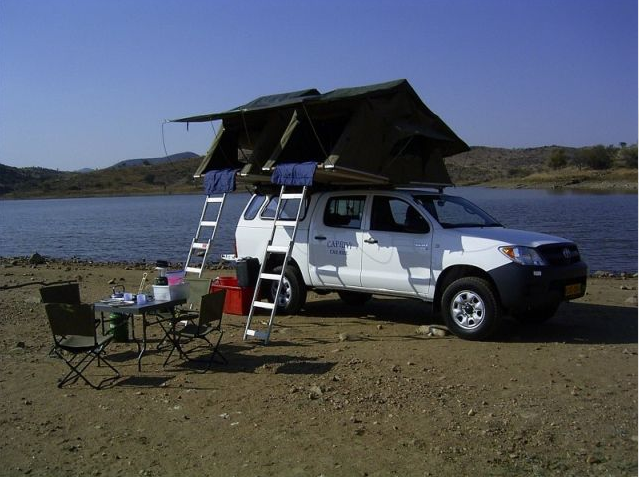 The Toyota Hilux Double Cab (four-wheel-drive, 4x4) with camping gear for 4 people (2 roof tents) is the ideal vehicle for self drivers that want to experience untouched nature and love to camp. With its four-wheel-drive this vehicle is suitable for all the streets in southern Africa, even for more challenging terrain. Things like personal luggage can be placed on the back seat, while all the camping equipment can be stowed away in the closed canopy. Bigger tyres and more clearance height than normal passenger cars make this vehicle comfortable in the open country and give a better vantage point for animal viewing. The Toyota Hilux Double Cab has a 6-speed manual transmission with a selectable four-wheel drive and a 2.4 Turbo Diesel 4-cylinder engine. The vehicle is equipped with power steering, ABS brakes, air conditioning, USB and a radio. From the insurance point of view there are three maximum speeds on our roads: Maximum speeds are 60km/h in cities, 80km/h on gravel roads and 120km/h on tar roads. According to the insurance policy, these maximum speeds may not be exceeded. All of our vehicles are equipped with a satellite-aided tachograph.